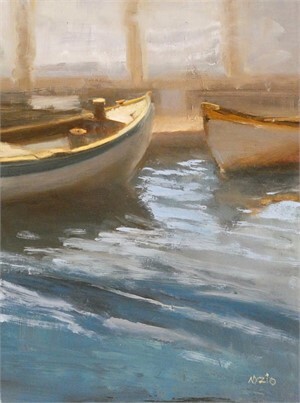 I′m Donna, a representational oil painter living, and painting, in the coastal town of Beaufort, NC. In 2016 I determined that life is too short not to paint. So I cleared my scheduale and began to focus intensely on the study of painting with emphasis on coastal subjects. If I can create a feeling of serenity, humanity, or a luminous atmosphere, then I feel my painting is a success. My work emphasizes big shapes, often simplified from piles of chaos. Painting with a combination of thick and thin paint, I focus on motion, atmosphere, and light. 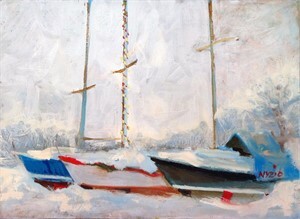 Primarily, I am a studio painter, but I also paint en Plein Aire. I even combine the two if I feel it will help me capture my ideas. Born on the Rhode Island coast, I have lived all along the eastern seaboard. I am not a sailor or a captain, nor do I build boats, but I am well acquainted with those who do. I enjoy the movement of the water, the smell of the air, as well as the subject matter found in the coastal environment. What I love most are the rhythmic sounds and movements that create a sense of peace and tranquility. After earning a BFA from Carnegie Mellon in Pittsburgh, PA, I continued my studies with instructors who shared my love of realism. But most of all, I learned more about painting by painting more. Professional Memberships include American Society of Maritime Artists, Oil Painters of America, and American Women Artists. I am a current fellow of the Clark Hulings Fund and the 2017 resident artist for the Friends of the NC Maritime Museum in Beaufort, NC. In addition to receiving a 2017 North Carolina Regional project grant, I have participated in many national juried shows to include the 37th Annual International Marine Art Exhibition, Salmagundi Club non-members show, and the GreenHill Center for NC Art. My paintings can be seen in Atlanta, Georgia at the Lagerquist Gallery, in Mystic, Connecticut at The Maritime Gallery at Mystic Seaport, and at Ballantyne in New Bern, NC. Scuttlebutt Nautical Books and Bounty will also have many small local pieces. View Donna Nyzio's Paintings on our marketplace. Donna Nyzio Balance Simple Shapes and Piles of Chaos Just Paint More I′m Donna, a representational oil painter living, and painting, in the coastal town of Beaufort, NC. In 2016 I determined that life is too short not to paint. So I cleared my scheduale and began to focus intensely on the study of painting with emphasis on coastal subjects. If I can create a feeling of serenity, humanity, or a luminous atmosphere, then I feel my painting is a success. My work emphasizes big shapes, often simplified from piles of chaos. Painting with a combination of thick and thin paint, I focus on motion, atmosphere, and light. 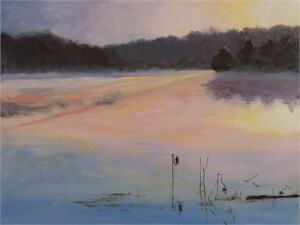 Primarily, I am a studio painter, but I also paint en Plein Aire. I even combine the two if I feel it will help me capture my ideas. Born on the Rhode Island coast, I have lived all along the eastern seaboard. I am not a sailor or a captain, nor do I build boats, but I am well acquainted with those who do. I enjoy the movement of the water, the smell of the air, as well as the subject matter found in the coastal environment. What I love most are the rhythmic sounds and movements that create a sense of peace and tranquility. After earning a BFA from Carnegie Mellon in Pittsburgh, PA, I continued my studies with instructors who shared my love of realism. But most of all, I learned more about painting by painting more. Professional Memberships include American Society of Maritime Artists, Oil Painters of America, and American Women Artists. I am a current fellow of the Clark Hulings Fund and the 2017 resident artist for the Friends of the NC Maritime Museum in Beaufort, NC. In addition to receiving a 2017 North Carolina Regional project grant, I have participated in many national juried shows to include the 37th Annual International Marine Art Exhibition, Salmagundi Club non-members show, and the GreenHill Center for NC Art. My paintings can be seen in Atlanta, Georgia at the Lagerquist Gallery, in Mystic, Connecticut at The Maritime Gallery at Mystic Seaport, and at Ballantyne in New Bern, NC. Scuttlebutt Nautical Books and Bounty will also have many small local pieces. View Donna Nyzio's Paintings on our marketplace.